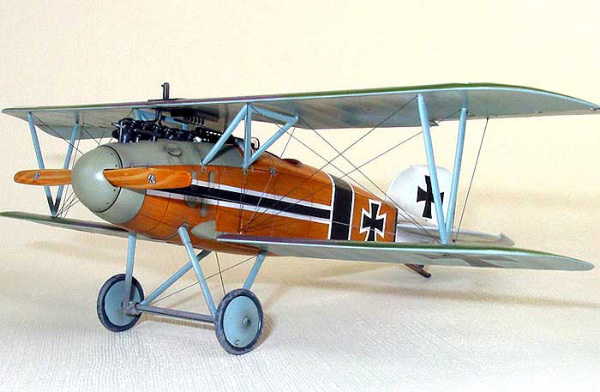 The Albatros D.I and D.II had proved to be superior to any of the available Allied types. German fighter pilots therefore, congratulated themselves in January 1917, when a third and even better Albatros Scout arrived at the front, the D.III. Some of the first D.IIIs were supplied to Jasta 11, commanded by Baron Manfred von Richthofen. On January 24th, 1917, when von Richthofen was attacking an F.E.2b, a dangerous crack appeared in the lower wing of his machine. He was able to land safely, but his trust in the Albatros designs was temporarily shaken, and he flew a Halberstadt D.II for a time. On the same day. two pilots of the Jasta Boelcke were killed through similar wing failures. The source of the trouble lay in the single spar of the lower wing—it was positioned too far back from the leading-edge and tended to twist under stress. The D.III had inherited the structural weakness of the Nieuport Scout. In spite of this drawback, the D.III had a better rate of climb than its predecessors, and its pilots ran up considerable personal scores. January to May 1917 were successful months for the Jagdstaffeln. One Mercedes D.IIIa inline water cooled engine, 127 kW (170 hp). Two 7.92 mm (.312 in) LMG 08/15 machine guns .